The Heeney Marina is a ramshackle kind of place, but not without its charms. Located in the town of the same name on the western shore of Green Mountain Reservoir, the facilities include a trailer and a few wooden docks. The former has a sparse inventory of worms, tackle, and candy, as well as a few monster trout trophies mounted on the walls. It fulfills my expectations. When I told people where we were going, even Colorado natives like myself, the standard response was, "Heeney? Where's Heeney?" That made it seem like the perfect place to get away. The marina is manned by Craig Phenicie and his happily hyper Australian dog of some kind, Captain. My dad and I had arrived on one of the coldest August mornings in recent memory for a day of fishing on the reservoir. We’d reserved a 18-foot pontoon boat from Craig for our first fishing trip together in several years. A father-son fishing trip was once an annual tradition. We’d go to my grandpa’s cabin in South Fork when I was a kid, then we hit Minnesota a couple of times in my twenties and Baja, Mexico, five times in my thirties. I remember fishing Jackson Lake in Grand Teton when I was 30 and my dad was 60, the only time in our lives I would be exactly half his age. Now he’s 71 and I’m 41. In a few years, I’ll be exactly 60 percent of his age. Craig gives us a few tips on where to troll before untying us. "Is there a legend?” I ask before we drift from earshot. "There’s always a legend,” he laughs and heads back to his trailer. I steady the wheel as my dad rigs up our poles. "He’s a character,” I say of Craig. "He lives his own life,” my dad replies. We talk about sports and family and work and all sorts of things. I catch a rainbow trout, the first fish I’ve caught in Colorado in literally years, and my dad gets a bike. After about three hours, we’re at the inlet where the Blue River becomes the reservoir, about seven miles from the dam. That’s when the first raindrop falls. We start back towards the dam and the drizzle becomes a shower. The wind picks up and whitecaps dot the water. It’s a brutal 45 minutes to the marina. We get completely drenched. It’s a relief to get out of the boat. My hands and forehead ache with cold. Craig cuts us a deal because we returned the boat a little early and we head back to our unit at Melody Lodge Cabins to dry off and warm up. That task requires about 90 minutes, after which we decide to try our luck casting at Cataract Lake, about 10 miles from the cabins. We see a bald eagle perched in a tree on the drive. The trailhead offers views of a waterfall, and it’s just a few minutes’ hike to the lake. We throw out our lures and reel them back, then repeat. After 10 minutes and no strikes, my dad suggests we wander the trail a bit. It’s two miles around the lake, and my dad struggles a bit on some of the rockier stretches, but it’s more than worth the effort. 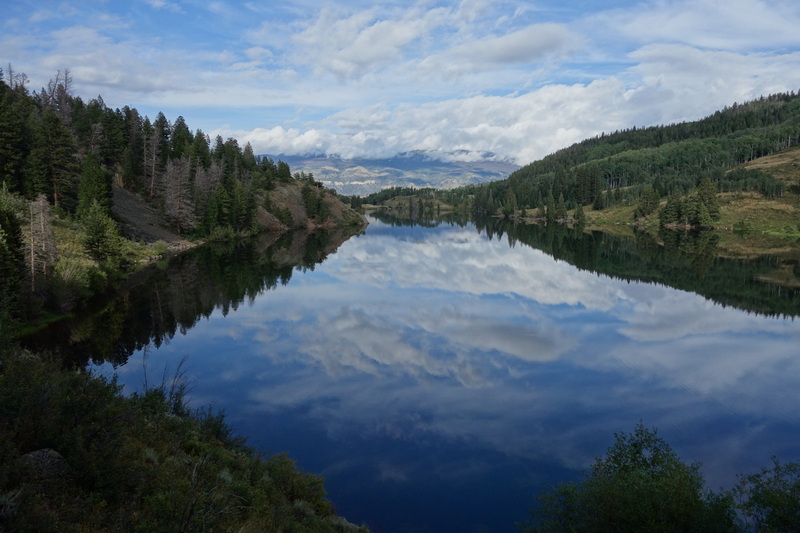 A beaver slaps his tail on the mirror-like surface of the water, we gawk at the ever-changing cloud cover, and get all sorts of beautiful vistas of the falls and the Gore Range mountaintops above and the lake below. Back at the cabins, my dad says hi to a woman on the porch of the unit next to ours. I’ve always admired my father’s ability to talk to any and all strangers. I’m antisocial, and sit inside and jot down a few notes. He returns after a few minutes. As we make dinner, we start making plans to return next year. As my dad puts it, ”The fishing was great but the catching was bad.” There were some highs and lows, and we didn’t even keep the rainbow trout, but it was a great day to catch up, see the sights, and watch the day go by.